TOKYO (AP) -- Japanese clothing chain Uniqlo has leveraged its prowess in mass production to build a fashion empire filled with shelves upon shelves of affordable, good quality items like down jackets, underwear and T-shirts. Now the 17-nation, 1,734-store retailer is on a quest to beat Western giants like Gap, H&M and Zara to become the world's biggest apparel-maker. In the overcrowded, highly competitive casual fashion market, size is important, but no guarantee of success: Analysts say Uniqlo’s challenge is to carve out a brand identity of its own, going beyond its formula of delivering no-nonsense quality at good prices. “To win over consumers and break through the clutter, Uniqlo needs to get even more personal,” says Stuart Green, chief executive of Asia-Pacific at Interbrand, which consults and ranks brands. “It will be critical for Uniqlo to maintain product quality and, most importantly, create a deeper, more emotional connection with its customers to drive brand loyalty,” he said. Interbrand ranks Uniqlo as Japan's most valuable retail brand, and No. 8 among Japan’s global brands, including Toyota, Sony and Nintendo. The company's founder and chief, Tadashi Yanai, is Japan’s richest man, according to Forbes magazine. Analysts say that to move it to its next stage of growth, Uniqlo also needs to beef up its digital presence and adapt to non-Asian markets. Winning over the huge market of suburban American shoppers will be crucial. Consumers these days are picking brands on digital platforms and social networks, as they increasingly shop online. To cope with the mind-boggling volumes of information online, consumers now rely on brands to serve as filters and curators, Green said. To help drive its global expansion, Uniqlo is tapping outside talent. It just hired Christophe Lemaire, formerly of Hermes and Lacoste, who started his own Uniqlo line last year, to head its Paris research center. In 2014, it brought in a global branding expert, John Jay. An American of Chinese origin, he worked on ad campaigns for Nike, Coca-Cola and Microsoft, and a fleece campaign for Uniqlo, at U.S. marketing company Wieden+Kennedy. “Whether they’re in Beijing or New York, there is a commonality to young people and what they want in life,” Jay, whose title is president of Global Creative at Uniqlo’s parent company Fast Retailing, said at a recent Tokyo event, centered on Uniqlo’s second fashion show ever. “We have barely scratched the surface. Our potential is amazing,” he said. Uniqlo is still relatively small, with 44 stores in the U.S., 449 stores in China and 846 in Japan, its biggest market. Retail giant H&M of Sweden has 4,000 stores around the world, Gap Inc. of the U.S., 3,700 stores, and Inditex of Spain operates 7,000 Zara, Bershka and other brand stores. H&M and Inditex have posted healthy financial results recently, but Gap, which has the Old Navy and Banana Republic brands, is struggling, slashing prices to draw buyers and closing dozens of stores, including some in Japan. The Standard & Poor’s credit rating agency recently downgraded Gap’s debt to junk status. Uniqlo’s profits also have slowed recently, hurt by a warm winter that slowed sales of its down jackets, HeatTech underwear and other winter apparel. 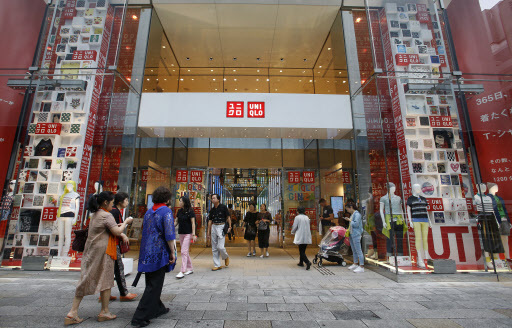 Fast Retailing, with 100,000 employees, forecasts a profit of 60 billion yen ($565 million) for the fiscal year through August, down 46 percent from the previous fiscal year, mainly because of falling profits at Uniqlo. Yanai’s turnaround plan includes sweeping cost cuts, improved efficiency, pricing reviews and, perhaps most importantly, greater flair in the company’s fashion offerings, building on collaborations with designers. The company asked Nigo, a Japanese disc jockey with a reputation for innovation who created The Bathing Ape clothing line, to add more flair and edge to his T-shirts. A partnership with Carine Roitfield, former editor-in-chief of Vogue Paris, has brought into Uniqlo stores chic designs unlike most anything else you’d find. The company has strengthened its sportswear, signing on tennis stars Kei Nishikori and Novak Djokovic. Uniqlo also has partnerships with labels like Liberty London, with its colorful flower-pattern fabrics, and Hana Tajima, a designer who specializes in Muslim clothing such as head scarves and long dresses. Uniqlo executives believe fashion is globalizing, and people around the world, from China to New York, more or less want the same thing -- quality for reasonable prices and clothes that suit their lives. On a recent weekday, the company’s 12-story Ginza store was crowded, as tourists milled around in front snapping selfies in front of what has become a city landmark. Olga Symonenko, an information technology worker from the Ukraine, said she had heard about Uniqlo from friends who had been to the store in the U.S.
“The prices are good, and the quality,” she said, happily clutching two blue dresses. She said she and her husband planned to pick up 20 items.